Since you use a webcam to take video, we feel the most important attribute to look for when buying one is video quality. Not just whether or not it is in HD, either 1080p or 720p, but also if it captures motion without making it look like a blurry mess. Other features to look for include affordability, still picture quality, auto-focus, portability, and sound input. When reviewing these devices two companies stood above the rest – Logitech and Microsoft. Here is our list of the top 5 best webcams. By far the best product we reviewed, and most expensive at about $72, was the Logitech C920 Pro with its full 1080p high def video. It has best-in-class smooth video quality with H.264 HW video compressing for faster uploading and downloading using less bandwidth. Other features include a Carl Zeiss lens, a 20-step auto-focus, and dual stereo microphones. One thing we do not like about it is, while the camera moves up and down, there is no side-to-side movement. Also note that Logitech says it does not work with Mac OS X, but most users have had no problems making it work with a Mac. 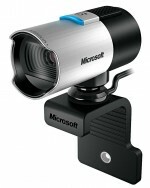 Our highest rated Microsoft web camera is the LifeCam Studio which will cost about $62. It can record video in 1080p HD, but only 720p for video chat. Also the software included with this model does not support full 1080p video, only 720p, so you need another piece of commercial software if you want to make 1080p videos. Having said that the video quality itself is very, very good and works great with Skype. The optics feature a high-precision glass lens and auto-focus. 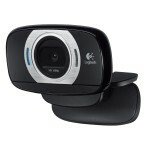 One advantage it has over the Logitech C920 is the 360 degree view range. 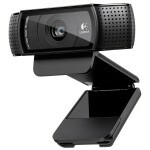 The Logitech C615 is a great portable webcam that will cost about $55. While the video quality is not as impressive as the top 2 choices on our list, it still supports full 1080p video recording and smooth 720p video calling. The main advantages of this model are its compact design and fold-and-go capabilities that make it easy to take with you on the go. Also, unlike the C910, this one rotates a full 360 degrees. Microsoft’s second best model is the LifeCam Cinema at about $45. It does not offer full 1080p HD, instead just 720p video for recording and calling. The video quality is still good, just not quite as good as the Studio cam. It also has auto-focus, glass lens, 360 degree rotation, and a noise canceling microphone. 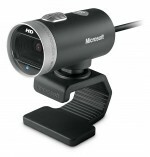 Even though Microsoft does not list Mac compatibility, most people report no problems using their webcams with Macs. 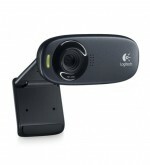 The best budget webcam is the Logitech C310 at just $30. The video quality is the worst of the 5 models on this list, but is still surprisingly good and fluid 720p HD. It only has a plastic lens, not glass, and has an always focused focus type instead of auto-focus. It also does not have side-to-side rotation. Despite that we still highly recommend this model for those looking for an inexpensive but capable webcam.